Looking forward to how it works on everyones phones. I think it's a good thing though. One of the early betas which also had a few issues there was a few WEEKS in between it and the next one. Are the performance issues with OTA of beta 7 fixed? What performance issues? Are you thinking of the release of developer beta 7? PB7 was wonderful! Anyone know why i cant get the last update, under profile says no profiles are currently installed? 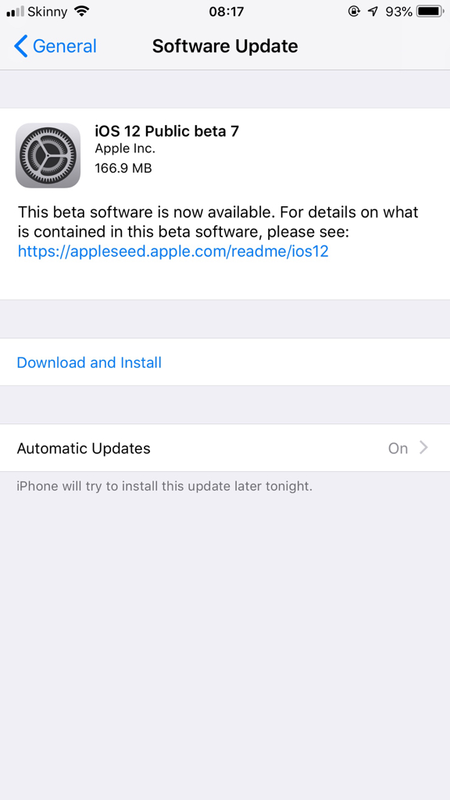 iOS 12 beta 5 was last update i could do. Because you don’t have the beta profile installed. Yes i do says iOS 12 in about. Profile in settings is missing altogether now. They’re really ditching the Bluetooth On icon. You need to reinstall it or you won’t get any further betas. Ok, that fixed it, Thanks. Don't know why it disappeared didn't happen on my iPad. Yup, that's exactly what I'm referring to. Glad you didn't have issues but many, many other's did to the point Apple pulled the OTA update and within 3 days released dev beta 8, so I'm curious. Updates via iTunes seemed to have been unaffected. It’s rare but it can happen. Happened to me once on 11.3 or 11.4 beta. The same thing happened to me. iPad updated to beta 4 but there was no update for the phone. When I checked profiles the beta profile which had got me up to beta 3 was gone! I reinstalled the beta profile and continued with the updates. I have no idea why it happened but just do the same as me and reinstall the beta profile and you’ll be able to catch up again.